Maybe this proposal seems rather overused and boring as it was already stated in several ways by several green politicians. Additionally, some maybe will judge it as naïve and economically harmful, because it could negatively affect workplaces within industries depending on fuel and similar input. Ultimately, some even will call it unfair, because in the short-term it directly affects hard working people who seemingly have no choice but to commute by car. However, commuting by car every day just because one prefers a cheap, quiet or just habitual domicile in the periphery is not fair either. Additionally, believing that the rest of us can and will accept environmentally harmful economic activities is naïve too and making money because the government did not found a way to internalize external costs yet even is inefficient. Ultimately, that it is necessary to repeat a simple and in the long run inevitable proposal is rather sad than boring. Of course, the extension of the public transportation system has to be provided first and it will be costly. However, ignoring the problem and hiding from politically uncomfortable and unpopular decisions will cost us all even more. I am going to teach basic macroeconomics to undergrads in the fall and I want to show them the simplest way to solve an economy on the computer. So I discovered a technique used by Yale’s John Gaenakoplos in his fantastic Financial Theory course. He’s using it to solve a 2×2 pure exchange economy. I’m applying it to a miniature Keynesian model. (1) is the Simple Keynesian Consumption function relating private consumption (C) to net national income (Y-T) with MPC being the marginal propensity to consume. (2) is the goods market equilibrium condition, where I is business investment and G is government expenditure. Solving the economy involves three steps: (i) set the MPC parameter, (ii) set the exogenous variables (I,G,T), (iii) solve for the endogenous variables (C,Y). Of course, since this model is all nice and linear, it’s easy to derive closed-form solutions. But in more complicated models such as ISLM, finding closed-form solutions can quickly become quite tedious. So I want the computer to do it for me. (3) L(C,Y) = F(C,Y)^2 + H(C,Y)^2. I want Excel to minimize L(C,Y) with respect to C and Y, which can easily be done with the Excel solver. (Restrict all endogenous variables to be non-negative and select GRG as the solution method.) Why does this work? Because the minimum value of L(C,Y) is zero, hence F(C,Y) and H(C,Y) must also be zero in the minimum implying that (1) and (2) are fulfilled. If you want to know the multiplier effect of a tax cut or an investment boom, just change the relevant cell entries and re-run the solver. What a nice toy for rainy days such as this. I recently came across Hans-Werner Sinn’s 13 theses on climate policy. Prof. Sinn’s main target is Germany’s policy of radical transition from fossil fuels to renewable energy sources – the famous “Energiewende”. I think some of his arguments are very well taken, others are rather dubious. In particular, I would quarrel with theses #2, #3, and #4. But at the moment it is #10 which gives me headaches. This seems to be a perfectly valid argument. Now take a look at the graph below. It shows greenhouse gas emissions relative to the base year 2005, which is the year when the EU’s emission trading system began, for Germany (blue line) and the rest of the European Union (red line). Data source: Eurostat. 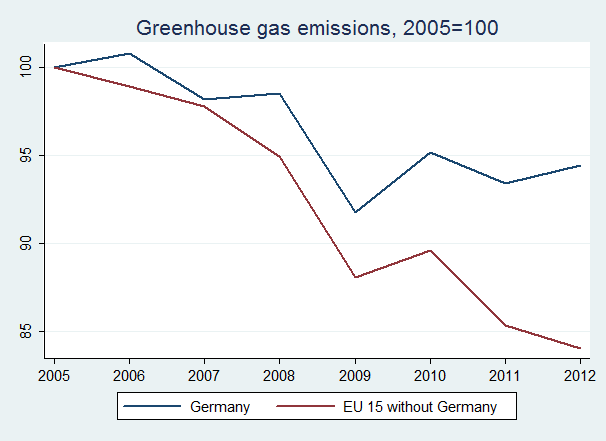 If Prof. Sinn’s thesis is correct, Germany’s emissions should have decreased faster than in the rest of the EU. Yet the exact opposite is the case: German emissions fell by 5 percent between 2005 and 2012 compared to 15 percent in the rest of the EU! What’s going on here? I can’t see any mistake in Prof. Sinn’s analysis, but his analysis seems to be completely at odds with the data. The logical conclusion is that I must be missing something. What am I missing? Help!